At Masa, our programs build confidence and community while preparing young people to succeed academically. Masa engages whole families, helping parents build skills to advocate for themselves, their children, and their communities. Volunteers are essential to Masa. There are many ways to get involved, from outreach to our after-school program. Patience and persistence! Building the meaningful relationships I now have with students I’ve worked with for two or more years has been the most gratifying journey. The scholars I worked with are such smart, considerate, and kind individuals. They have such great potential. I know that if they work hard and believe in themselves they can achieve anything they want. 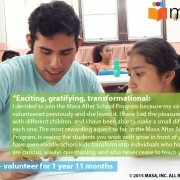 Fun, learning, and smiles: After three years of volunteering at the Masa After-school Program, my experiences are still life-changing. 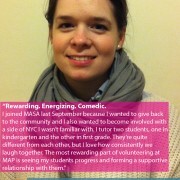 Tutoring can be challenging but joining Masa means you’re FAMILY: you’ll find the support you need to get the job done. Our family is invested in advocating for children and families, improving grades, sharing cultural experiences, and having fun. Masa rocks! Rewarding. Energizing. Comedic. I joined Masa because I wanted to give back to the community and I wanted to become involved with a side of NYC I wasn’t familiar with. I tutor two students — they’re quite different from each other, but I love how consistently we laugh together. The most rewarding part of volunteering is seeing my students progress and forming a supportive relationship with them. Exciting, gratifying, transformational: I have had the pleasure of working with different children and I have been able to make a small difference with each one. The most rewarding aspect so far is seeing the students you work with grow in front of your eyes. I have seen middle school kids transform into individuals who have integrity, are curious, always questioning, and who never cease to teach you. Join Masa for Día del Niño! Masa will hold its annual celebration of Children’s Day on Saturday, April 27th, 2019! Join us for a fun-filled afternoon free reading, art, and science activities for children of all ages. See more information here, and, if you’re interested in signing up to volunteer, click here. Learn more about the work we’ve been doing this winter — including our new young women’s group, Las Adelitas, and our women’s financial empowerment group, Mujeres Inmigrantes para la Liberación Financiera — in our most recent newsletter. 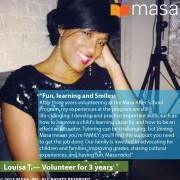 Masa is recruiting for several new programs! Masa is recruiting for our youth programs, offering free immigration workshops, and providing on-site support with SNAP enrollment and 3K/Pre-K applications. Learn more from our recent newsletter! Bring Masa to more families. Your contributions help us expand our education programs for children, youth, and parents.